Serving a crispy yet juicy chicken pane is a challenge, don’t over fry the chicken and follow the correct pane method. Remember: marination is the key to delicious breaded fried chicken. Seasoning the flour with Knorr Chicken Seasoning powder locks in the flavour. 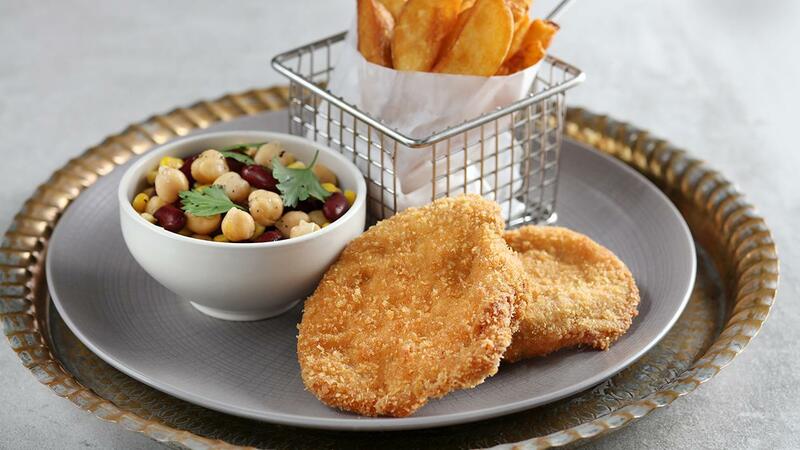 Our choice of a side is a healthy three bean salad. Add balance Knorr Chicken Seasoning Powder to the flour. Steps for coating chicken: First dust the marinated chicken with flour, then dip into egg mixture, finally coat with breadcrumbs and fry until golden brown. Wash and rinse the beans, corn and peas. Marinate with parsley, olive oil and Knorr Lime Seasoning Powder. Serve on the side as warm or cold salad. Serve with French fries and a sauce. We recommend a cheese, pepper or mushroom sauce.